1. You can use the Coupon Code: "cl200d" in checkout to save $200 on any NEW system (except the RG500 and VL500 - These systems are already at the lowest possible price). We also offer additional discounts to non-profit organizations, students and anyone in the military. 2. With every new system, you get the Laser-Therapy.US dynamic protocol tool ($1495 Value). If you really study lasers, you know that many of the highest-end lasers have some form of digital protocol library (like the LiteCure™ Compass) that use a computer to dynamically adjust the dosage to each patients needs. This tool is a best-practice for getting the dosage optimized and it takes a computer (or someone with a calculator and lots of time) to properly adapt the protocol for patient size, skin color and therapy goal. Now this same technology is available for every system sold from ColdLasers.Org. This is not just a printout of generic protocols like you get from some low-end laser companies, this is a web-based application that dynamically creates protocols to treat hundreds of conditions for humans, dogs and horses. It can be run on a cell phone, tablet or PC. This tool also includes a research tool that allows anyone to search over 4000 published research papers, dozens of books and hundreds of videos to find information related to using cold laser on a wide variety of conditions. 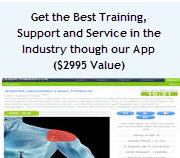 The Library and the research tool together allow users to learn successful treatment protocols and drill down to see the original resource used for the protocol. Our protocol generator creates step-by-step custom therapy plans for over 200 conditions for humans, pets and horses. The system includes a therapy assistant that tells users exactly where to use the laser and how long to use it for best results. It also includes resources that trace back to books, studies and other resources related to treating each condition with a laser. This is one of the most powerful tools available for laser research and dosage calculations. The "cookbook" protocols take all the stress and guesswork out of finding the optimum dosage for a variety of conditions. Some manufacturers sell individual protocol printouts for $30 to $40 per protocol. That puts the value of the Laser-Therapy.US protocol library at over $4000. If you buy a laser from anyone else, you are typically on your own to figure out how to use the laser for any other conditions outside of the most basic protocols. In many cases, the factory documentation does not include any treatment protocols. If you are new to cold lasers, the Laser-Therapy.US protocol library can make the difference between night and day on your ability to properly treat a wide variety of conditions. Right now, laser technology is rapidly changing so don't rely on an obsolete book, printout or manual that was written 10 years ago and is ridiculously out-of-date. 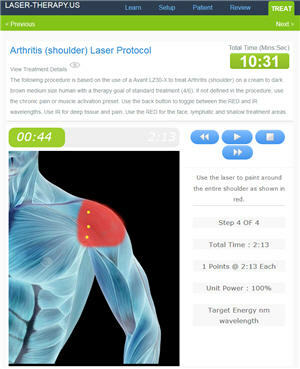 Since the Laser-Therapy Protocol library is online, it is constantly being updated and improved. If you want the best, you need to buy from ColdLasers.Org.